Bad Luck Strikes in 3s: Dushanbe to Aktau. Misfortune was overdue. That doesn't mean it's welcome. The Sher-Doh Madrasah, in central Samarkand. I left the Pamir on a high. The 9 days or so crossing from Osh to Khorog - and my couple of days in Afghanistan - ticked every box: it was a challenge, but not too much of a challenge. There were few fellow travelers, but enough to share tales of adventure with. The mountains were serene but accessible. The villages remote, but picturesque and welcoming. The soaring peaks of the Pamir, though, were soon just a distant memory, as I pulled into Dushanbe after a 20 hour shared-taxi ride from Khorog. It was early on a Sunday morning, and I checked into my tacky hostel dorm which I’d be sharing with a young Ukrainian on his own round the world jaunt. I was in Dushanbe for one reason: to pick up my Turkmenistan visa, which I’d applied for in Bishkek a fortnight earlier. Perhaps the dullest of Central Asia’s capital cities, I endeavoured to head immediately for the Uzbek border after securing my Turkmen visa on Monday morning. That first Sunday afternoon, I strolled the streets of Dushanbe, which are pleasant enough. The streets are typically Soviet: well organised, rather pretty with large trees, boulevards and ridiculous statues. The main feature of Dushanbe is its endless portraits of Emomali Rahmon, Tajikistan’s president since independence in 1991. They also have the second tallest flag pole in the world, which is visible from almost everywhere in central Dushanbe. After rapidly becoming bored by the town, I sat at a small cafe, churning through cheap coffee and finishing Hitch 22. After some time, a scruffy Canadian wayfarer a few years my senior sat at my table. Leigh was his name - he was a former oil and gas engineer from the Canadian prairie, who’d made his fortune during his 20s and was spending the twilight of his youth - and his enormous fortune - gallivanting across the world. Leigh sat down and ordered two beers. He insisted on paying, and continued to, round after round as the sun faded and the world cup was switched on. For a few reasons - primarily financial - I’ve barely drunk on this trip. Just three times I’ve been inebriated in 2018: the first in East Timor with a family in Beto Tasi; the second on vodka in Jinghong during my first night in China, with a local chef and his mates who communicated to me through Google translate; the third with a German industrialist in Ulaanbaatar. This would be the fourth such occasion, and the consequences would be dire. I liked Leigh and his stories of life on rigs in the middle of nowhere. But he could drink far more than I. I wobbled my way out of the cafe about 9 hours after I’d entered. My tab was $0, thanks to Leigh’s generosity. But the repercussions would be far more costly. On my way home, I’d grabbed some much needed street food and stumbled into bed full-bellied. But when I woke the next morning with a paint-stripping hangover reminiscent of my early 20s, it was clear my late night kebab hadn’t done the trick. I ignored the agony, and pushed through the 3 kilometre walk to the Turkmen embassy to pick up my visa. It was Monday morning, and a large queue had already gathered by 9am. We all sat waiting our turn to be summoned inside. The back-alley behind the Turkmen embassy was stiflingly hot, with no shade. Afraid to give up my spot in the queue, I resisted leaving until I couldn’t possibly withhold the contents of my stomach. Rushing to the privacy of a nearby alley, I violently vomited into a gutter, in perhaps the lowest point of my entire year. In these moments, your mind suddenly admonishes itself: why am I here? I’d ask. It’s entirely voluntary and unnecessary for me to be here - in Tajikistan - vomiting into a gutter on the outskirts of Dushanbe, only because I’m attempting to secure a visa to one of the world’s most ruthless dictatorships. I’d left a joyous, privileged life and career in Sydney in search of wholesome adventure, only to succumb to the temptations of free booze in some Central Asian backstreet bar. It was a preposterous, self-induced scenario that wracked me with the depressive guilt often associated with a crippling hangover. A migraine flared up and the most profound, disorienting nausea continued to cloud every moment. It was in this ghastly state, under the blazing sun, that I stewed for over three hours, until the large gates opened and I was ushered in to the embassy. I wiped the last traces of vomit from my beard, splashed some precious water on my face, and followed the guard inside. Despite my state, I entered confident: the Turkmenistan visa is among the hardest in the world to get. But I’d done all I could. I handed my passport through a window to a smartly dressed Turkman standing in front of an absurd portrait of his president-for-life, Berdimuhamedow. He tinkered at his computer for 15 minutes while I writhed in agony and discomfort outside. Soon, progress: “Edward!”, the man exclaimed, summoning me in. “You’ve been refused. You will not travel to Turkmenistan”. My heart sank. Plans were shattered in an instant. I asked why. He refused to go into details. I asked if I could apply again. “No”. What about in a month? “No”. A year? “No”. Another embassy? “No”. Could I ever apply again? “No”. He offered but one consistent piece of advice to every question: “No. You cannot travel to Turkmenistan. Do not try again”. I was frustrated, vomitous, and angry. I hold zero respect for the villainous Government’s of thugocracies like Turkmenistan, but was happy to play nice and do what was required to pass through the country. I tolerated penning the sycophantic letter of intent, feigning my deep respect for the Government and pretending I’d be interested in seeing the marble and gold encrusted vanity projects of Ashgabat that the previous Turkmen dictator had wasted his people’s oil-money on. So when I was refused, for no specific reason, I was pissed off. I nearly spewed a verbal diatribe towards the poor embassy representative before common sense over-rode my emotions. I wandered back to my hostel to plot my next moves, before my hangover took an even worse turn. I began to grow increasingly ill - my stomach wreaking havoc. I was unable to move, to keep water down, to do anything. I slept for 12 hours or so, and woke up on the Tuesday in far worse a state. In the end, my woes weren’t just from my hangover: it was clear that I was crippled with a bad food poisoning that would end up lasting three days and delay my exit from Dushanbe. That kebab was the only possible culprit. The thought of it now makes me queasy. That Tuesday was pure misery. Constant nausea, endless stomach cramps, and escalating dehydration all in an uncomfortably warm $6 hostel dorm room. It was, without a doubt, the lowest point of the trip - worse than wiping vomit from my lips in a back alley near the embassy the day before. In my few moments of relative stability, I figured out what to do next now that Turkmenistan was off the cards. In my moment of food-poison-induced weakness, I nearly bought flights across to Iran. It would be so easy. I’d arrive in Tehran with a little extra time to explore the country. I couldn't help it , I tried to rationalise, those Turkmenistan bastards made me do it. But I was kidding myself - seeking an easy solution to a problem that would have been at odds with the ethos and purpose of this adventure. Because I knew there was at least one, final - albeit risky, unpredictable - over-landing option: the Caspian Sea cargo-ferry to Azerbaijan. Catching this would preserve my unbroken over-land run from Singapore, and make the full Singapore-London overland journey a certainty. So I summoned the mental energy to plan my next week crossing the entirety of Uzbekistan towards western Kazakhstan to the Caspian. Kids getting into the World Cup spirit in Bukhara, Uzbekistan. 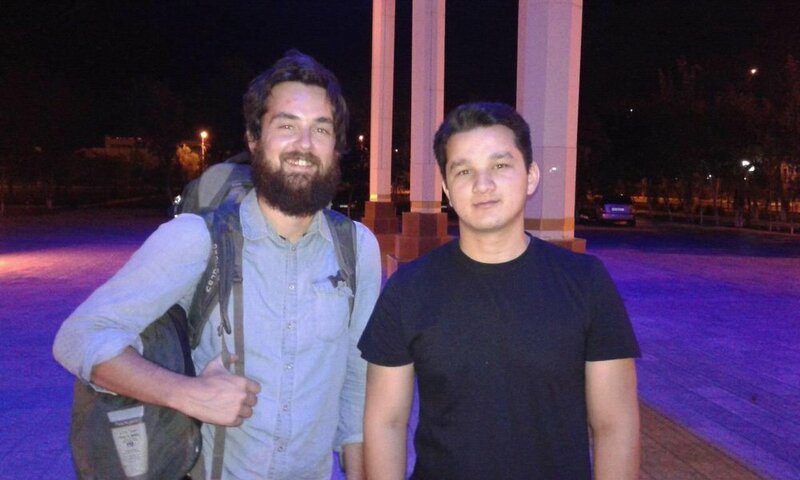 I’d finally regained some energy by Thursday of that week, and set off west on what was, in effect, a frantic Contiki-style tour of Uzbekistan. Thursday night I reached Samarkand - the country’s second city, spending Friday exploring its famed maddrassas. But I left almost immediately, racing to Bukhara for one day, and then to Khiva the next. Samarkand, Bukhara and Khiva are Uzbekistan’s crown jewels: the heart of its tourism industry. They are littered with ancient temples, madrassas and minarets - but for me, this wasn't worthy of the hype. All three cities felt utterly dull in comparison with almost everywhere I've ever traveled. My state of mind wasn’t particularly tolerant at this point - I was fatigued, still sick, and the heat was relentless. I struggled to identify anything of value in my Uzbekistan jaunt - it was a miserable few days across a country that, in my mind, felt equally miserable. 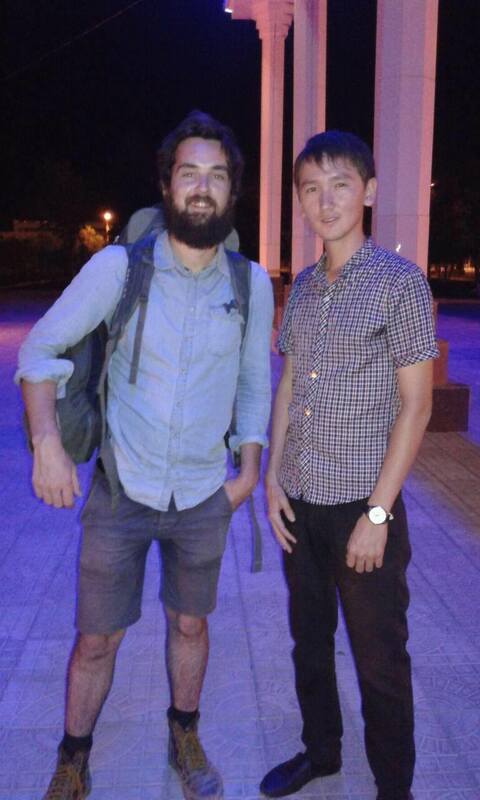 With a friend of Nursaltan's in Nukus. Taken at about 1am. There was one highlight: I made it to Nukus - a somewhat dystopian dust-bowl of a town in Uzbekistan’s far west - early one evening, waiting for a 3am train the following morning back to Kazakhstan. I planned to simply stay at the train station, so had no hostel to rest my head. Instead, I went to a tea-bar, and nestled into the Obama-nostalgia-trip that is Ben Rhodes’ The World As It Is, before being interrupted by a young English speaking chap, Nursaltan. "The isolated Soviet creation of Nukus (No'kis) is one of Uzbekistan's least appealing cities and gets few visitors compared to its attractive Silk Road cousins...However, as the gateway to the fast-disappearing Aral Sea and home to the remarkable Savitsky Museum – one of the best collections of Soviet art in the world – there is actually a reason to come here, apart from sampling the general sense of hopelessness and desolation." While not entirely off the mark, this is perhaps too harsh - and Nursaltan’s hospitality did Nukus a great service. He joined me for tea, and insisted on paying for me, despite his piddling annual income of less than $5000 a year (not bad considering minimum wage in Uzbekistan is, according to Nursaltan, less than $300 a year). It was around 11pm, and Nursaltan insisted on showing me his town. Because of the extreme summer heat, there is a surprising amount of activity in the middle of the night in Uzbekistan. People use the cooler nights to walk and socialise around town. So we strolled the city, walking through the various parks and public squares which to my mind were utterly uninteresting, but were talked about with a sense of admirable pride by Nursaltan. He professed his love for his underdog city, and I felt a sense of camaraderie with that sentiment. As an Adelaidian, I’m a proud defender my home town - which is objectively a paradise compared to Nukus, but often derided by ignorant passers-by - so I sympathised with Nursaltan’s attempt to broadcast his city in its best light; to change the narrative. If everyone in Nukus is like Nursaltan, perhaps the town is worth seeing after all. Looking depleted after a rough week. Nursaltan on the right. Nursaltan walked with me until 2 am, when I went to the station and boarded my train for the most intolerable commute of my life, without exaggeration. Overcrowded, the 1970s Russian carriage had no airconditioning, and set off for a 16 hour trip through a 45 degree Uzbek desert. The heat was utterly unbearable, and I almost succumbed to panic attacks due to the claustrophobia and stifling, humid temperature (this was my 83rd commute this year - that it was notably worse than the previous 82 is worth highlighting). Without resorting to hyperbole, I’d estimate the air temperature in the train was over 50 degrees celsius. Few men wore shirts. All profusely sweated, myself included. The poor women on the train were clad head to toe in traditional dress - so over-clothed that it made me feel uncomfortable looking at them and imagining their suffering. With the greatest sense of relief, I arrived in Beyneu, a small Kazakh city and the end of the line, went through customs, and found a shared taxi to Aktau, some 500 kilometres of desert driving away through the dead of night. Idling in Aktau: my wait in this Caspian port town provides a rare opportunity to catch up on some work, luxuriate in the privacy of a cheap hotel, wash my increasingly tattered clothes and shampoo my increasingly hairy head. The following morning, I darted straight to the ferry office to try and book a ticket from Aktau’s nearby port to Baku - the capital of Azerbaijan, about two days sailing way. I still hadn’t received my Azerbaijan e-visa, which was a few days overdue, so was relieved when the ferry office said that the boat wouldn’t go for a couple of days. This would give me enough time to recover from a week’s arduous travel, and to wait for my Azerbaijan visa to come through. Without my Azerrbaijan visa, I’d be prohibited from boarding. So I asked when the next ferry would come. “The next ferry will be about a week”, wrote back Julia. Profound misfortune! Had my Azerbaijan visa come through in the time expected, I’d be sailing the Caspian as I write, with ample time to see Iran and Armenia on the other side before a scheduled hiking trip in Georgia with my brother at the end of July. Instead, I’m stuck in Aktau - a pleasant enough town, but utterly uninteresting - for at least a week. The 10 days since Dushanbe have been the most unpleasant, testing, frustrating time in a trip otherwise defined by good fortune. Bad luck was overdue, I suppose. But it still doesn’t make it any less welcome. The only solace is that the hard work is behind me. After some 15,000 kilometres of arduous overland travel across 14 countries in over 80 cars, buses, trains, and other-things-with-wheels, the next country I’ll enter - Azerbaijan - once hosted Eurovision. The end is nigh. Day 5. The sun sets peacefully into the Caspian bringing a seemingly endless day to its much awaited close. Cooler breezes today allowed me to stretch my legs a little further, exploring some of Aktau's most revered sites, like a small Italian restaurant and the bank. No Albert today, but I guess Bukowski's is rather quiet on a Sunday night. Or perhaps he observes the Sabbath. Today's highlight was between 3 and 4 pm, after I ordered and slowly nursed a frappucino at an imitation 'Costas Coffee'. Despite its general dreariness, a small western-style cafe scene is bubbling up here out of the ether, serving an increasingly wealthy Kazakh middle class, and the few cashed up wayfarers who get stuck here on bizarre overland quests across the entirety of Eurasia.